Rackspace enables you to choose the data center where you want to store your content. You can select the Dallas (DFW), Chicago (ORD), North Virginia (IAD), Hong Kong (HKG), or Sydney, Australia (SYD) location through Rackspace multi-region support. This means that you can have your Cloud Servers or Dedicated Servers in one location and your data in another. Alternatively, you can keep them in the same data center to reduce latency and take advantage of free bandwidth by using our internal data center network, ServiceNet. If you only serve certain geographic regions, you might also find it helpful to locate the Cloud Files objects as close to those regions as possible. Note: Not all third-party libraries that communicate with Cloud Files support multiple regions. In some cases, if the tool that you use isn’t uploading to the region that you expect, you can ask Rackspace Support to change your account’s default region. Taking this step might get the tool to use your preferred region for file transfers. You don’t need to do anything to set up multi-region capabilities for your account. All US accounts have access to multiple regions. If you use the Identity API, you may choose the endpoint with which you want to interact. After you authenticate against the regional endpoint, your Cloud Files operations only affect that region’s content. 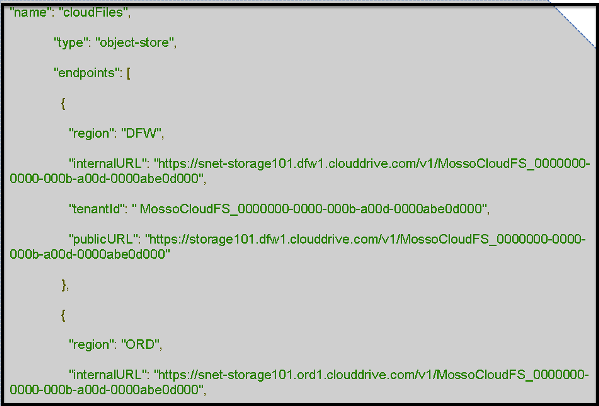 Note: Cloud Files does not automatically replicate data across regions. If you want your data to reside in multiple places, you must make requests to the appropriate multiple endpoints. You are charged for data stored in all locations, as well as related bandwidth charges. You can also use the multi-region feature through the Cloud Control Panel. When you create a container, choose the data center in which you want it to be located. The Cloud Control Panel reflects the location of your container. As part of this change, if you were an existing customer as of September 1, 2012, Rackspace set your current region as your default region. Your default region appears first in the list of endpoints that’s returned when you authenticate against Cloud Files by using our Identity API. If you have customers around the world, you can deliver your content rapidly with Akamai’s Content Delivery Network (CDN), which caches content at global edge locations and saves time because the requested content is received from within the region instead of coming from the origin data center.